In spite of all these sufferings, St. Paul never murmured or complained of the way God treated him, as weak souls do; or gave way to grief, as men do who care for their own honor and comfort; or prayed the Almighty to deliver him from his pains, like those who cannot understand their value and therefore desire to be freed from them. Unlike some Christians who shirk sufferings, he does not think them slight graces only. Far from it; rising above all ignorance and weakness, he blesses our Lord during his torments, and gives Him thanks for them as for a signal mercy. The apostle holds himself happy to bear something in honor of Christ, who bore such dishonor to raise us from the base condition in which our sins had placed us. For indeed, our Lord beautified our souls and honored us with the gift of His Spirit, and by adopting us as sons of God, He gave us a pledge that from Him and through Him, we should one day enjoy the kingdom of Heaven. God seeks to show you what a favor He does us, when the world thinks He punishes us. Oh, what an honor it is for us to be disgraced for seeking God’s honor, and what glory we shall one day get for the affronts we suffer now! How merciful, loving, and gracious, are the arms our Lord holds out to receive those who are wounded in the combat for His sake! In this our true joy far exceeds every bitterness the sorrow of this world can give. God forbid that our souls should find rest in or choose any other lot but that of suffering beneath our Lord’s Cross. I know not if bearing the cross can be called “pain,” for to my mind it is to repose on a bed of down and roses. This article is from a letter in Finding Confidence in Times of Trial. Now that it has come upon us, do not let it frighten us; do not let us be like children who will not repeat the lesson they have learned, but be strengthened in the Lord and in the power of His might. He will defend you for love of you, and although He is but one, He is more powerful than all the rest together, being omnipotent. Do not fear that He lacks wisdom, for He knows all things; and no one need fear being disturbed who is held fast to God by the three strong bonds of infinite love, power, and wisdom. I earnestly desire and beg of God to be merciful to them and give them blessings, in return for the curses they have heaped on others, and to give them glory for their insults, or rather, what they have sought to do to me, for I hold that, in reality, the only true honor in this world is to be dishonored for Christ’s sake. Look upon all your fellowmen as God’s creatures, whom He desires to be saved, and you will find that you cannot wish harm to those for whom God has such good will. Remember how often I have told you we must love our enemies, and keep our heart at peace, speaking ill of no man. Be patient in this time of trial, for our Lord will soon bring about a change of circumstances. On no account desist from any good work you have commenced, for that would be most wrong. Be thoroughly convinced that He whom you have followed is the Lord of heaven and earth, of life and of death, and that, in fine, even though all the world should strive to prevent it, His truth must prevail. Endeavor to follow Him, and then you need fear neither men nor devils nor even the angels, if it were possible for them to be against you in this. Speak little with men, but much with God in prayer in the depths of your heart, for all good must come to us from Him. He wishes us to obtain it through prayer, and especially to keep before our minds the Passion of Jesus Christ our Lord. If you suffer anything by the tongues of wicked men (and that is the only injury they can do you), take it as a satisfaction for your sins, and a special mercy from Christ. He uses them like a cloth to cleanse you from your faults, for they will be defiled by the foul things they say, while you will be purified by suffering, and your happiness in the next world made sure. I would however, on no account, have you think yourself any better than those whom you see now in error, for you do not know how long you may continue in the right path, nor how soon they may amend. Work out your salvation in fear and humility, and hope to reach heaven yourselves without thinking that your neighbor will never get there. Acknowledge the Almighty’s mercies to you, without reflecting on other people’s shortcomings, for you know that the history of the Pharisee and the Publican is intended for a warning to us. No sanctity is secure without the holy fear of God, in which I would have you “grow old,” as the Holy Scriptures say, by which they mean to teach us that we must not only begin with this fear, but persevere in it to the end. This fear is not irksome, but pleasant, and rids the heart of all levity: it keeps a man from self-confidence in his own merits, however good his actions may be, so that he leaves God to be the Judge both of himself and and of his neighbor, as St. Paul says: “Neither do I judge my own self, but he that judgeth me is the Lord.” This is He whom you must fear if you would continue in the right way, so that what you build up may not fall, but stand firmly and rise upward until it reaches the most high God; which end is to be accomplished by love. I pray our Lord Jesus Christ to bestow this love on you. Amen. 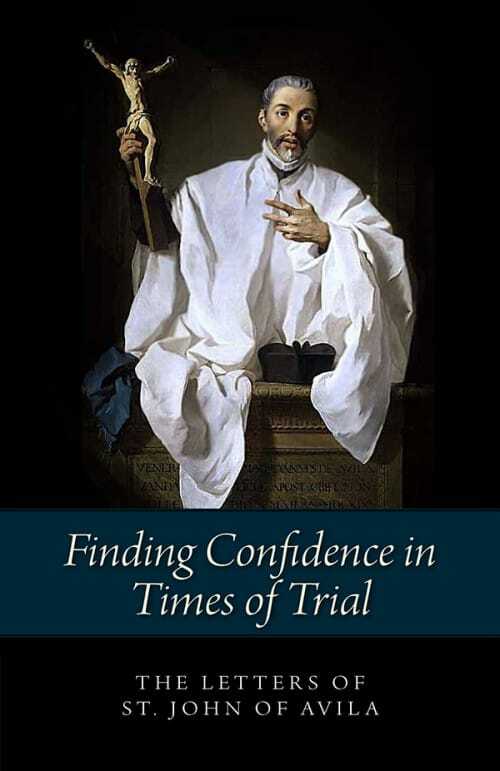 Editor’s note: This article is adapted from a letter of St. John of Avila, found in Finding Confidence in Times of Trial. It is available from Sophia Institute Press. St. John of Avila (1500-1569) led the authentic effort to reform the Church and Christian society during one of its darkest hours, largely through letters and meditations. Called a spiritual master by St. Teresa of Avila, Francis de Sales, and John Paul II, his writings are simple and profound.